by Strindberg, August, Carlson, Harry G.
Comments: This is a brand new book! Fast Shipping - Safe and Secure Mailer - Our goal is to deliver a better item than what you are hoping for! If not we will make it right! This item is unread with a few shelving bumps. 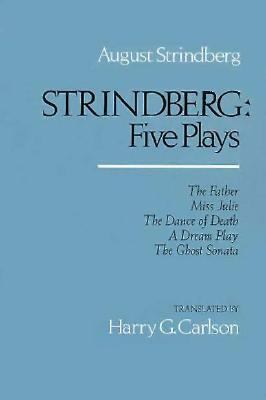 Strindberg, August, Carlson, Harry G.
Strindberg's most important and most frequently performed plays--The Father, Miss Julie, A Dream Play, The Dance of Death, andThe Ghost Sonata--are gathered together here in translations praised for their fluency and their elegance.Strindberg, August is the author of 'Strindberg Five Plays', published 1983 under ISBN 9780520046986 and ISBN 0520046986.